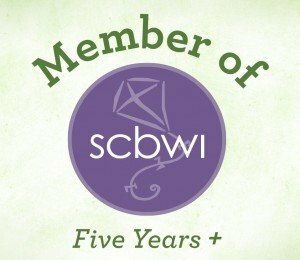 KIDS WILL HAVE FUN LEARNING ALL SUMMER LONG! If the SUMMER BRAIN QUEST® series of workbooks, which launched last summer, aren’t on your radar, now’s a great time to discover them. 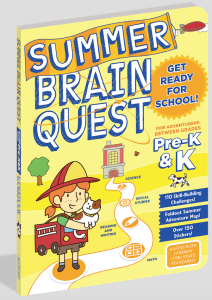 The most recent addition to the “parent-trusted and kid-approved Brain Quest series, America’s #1 educational bestseller” is SUMMER BRAIN QUEST: Between Grades Pre-K & K and is certain to make learning an adventure! This 160-page workbook/activity book has been designed to prepare four- and five-year-olds for school, something that Workman found both parents and educators have been requesting for this age group. Billed as a workbook, a game and an outdoor adventure all-in-one, SUMMER BRAIN QUEST: Between Grades Pre-K & K aligns with Common Core standards and cleverly and creatively covers Science, Social Studies, English Language Arts and Math. If your children are familiar with the popular Brain Quest decks, they’ll find this new workbook as enjoyable. Spanning eight levels of curriculum-based activities including ABCs, phonics, vocabulary, counting, shapes, patterns, maps skills, seasons and lots more, the workbook comprises a detachable foldout progress map, over 150 stickers “to track your progress on the map,” outside activities, a Brain Quest mini deck and a super cool Summer Brainiac Award certificate. Not only are there plenty of things to do indoors such as coloring pictures, tracing letters, counting and calendar skills there are also a bunch of exciting outdoor activities called quests including bug detective, making letters from sticks and ABC hopscotch. The colorful and inviting cover, map, and sticker artwork by video game artist Edison Yan will get your curious kids eager to open the workbook and easily engaged with the interactive style of the exercises. An answer key is provided at the end along with some SUMMER BRAIN QUEST extras. This is one workbook both you and your soon-to-be kindergartners will welcome. And a reminder, the SUMMER BRAIN QUEST series is available up to the summer between grades 5 & 6 so once your children get hooked, there are more books to look forward to. These 96-paged interactive workbooks make learning or reviewing core subjects, including numbers, ABCs, phonics, and reading readiness for younger grades, and math, reading, and writing for the older ones, an intergalactic adventure. “The material aligns with national Common Core State Standards and is designed to reinforce essential concepts and lessons taught in schools.” In the 4th grade math workbook I had fun shopping with Han where it’s necessary to read a word problem first and, using fractions and multiplication, find the answers to questions such as: “Imagine that Chewie needs quarrels to load in the bowcaster. Each projectile costs 2/6 credit. How much will 6 quarrels cost? 6 x 2/6 = ? _______ credits.” Not sure of the math involved? Answers are provided in the back. I know because I had to double check—it’s been a while since 4th grade. 3rd grade math topics include multiplication and division, measuring area and perimeter, word problems, quadrilaterals and graph reading. Illustrated throughout with fan faves like Rey and Finn from The Force Awakens as well as Luke Skywalker, Yoda, Obi-Wan Kenobi, and other creatures, monsters, Jedi, and Sith, the workbooks make math, reading and writing accessible and surprisingly enjoyable with their array of original art inspired by “Star Wars movies and the expanded Star Wars universe.” I mean it’s not every day that kids will find themselves eager to outline in order to write a Rebel Report from Princess Leia, picking up parts of speech at a new Imperial Pilot Academy or understanding adverbs by Describing Droids—all part of the 3rd Grade Reading and Writing Workbook. 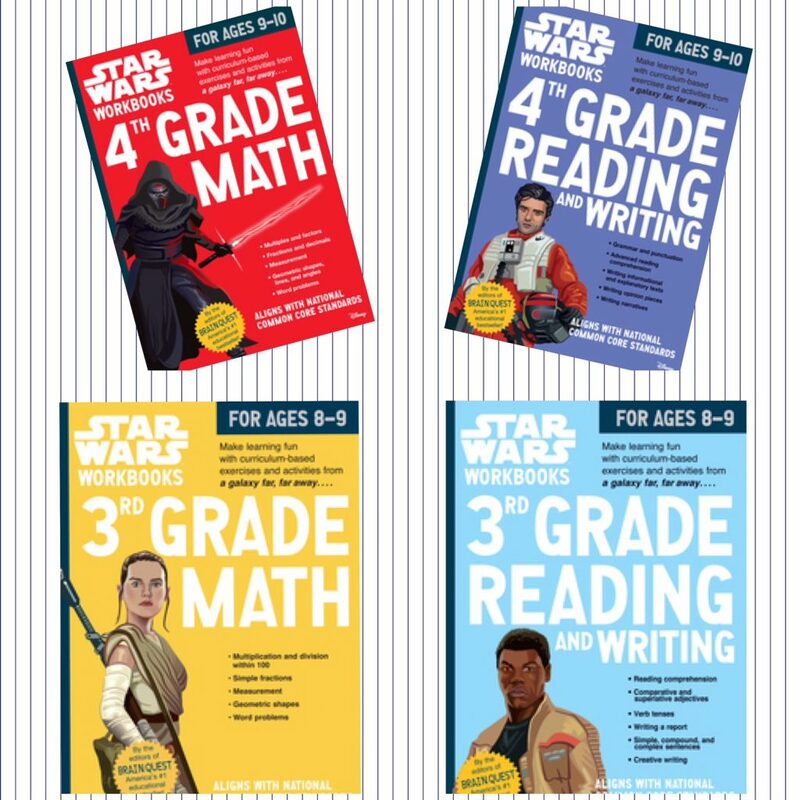 Comprehensive yet not overwhelming, the Star Wars Workbooks provide a clever incentive to get kids away from the electronics that will reinforce prior learning and introduce key grade-appropriate skills. Help your kids “stay on target” the Star Wars way for mastering school skills. 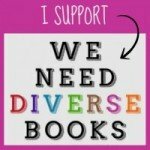 Find a review of a math activity book here. by Roger Priddy is reviewed by Rita Zobayan. Play and Learn with Wallace: Giant Workbook by Roger Priddy, Priddy Books/Macmillan, 2014.
content created by Ellen J. Bretherton, has over 300 activities that work on tracing, pen control, cutting and pasting, the alphabet, phonics, numbers 1-20, times table, days/months/seasons, colors/shapes/patterns, and telling time (both analog and digital). Number recognition is presented in fun games such as Matching Socks where you draw lines between socks or Bone Hunt where you match the dogs to their bones using number pairs. For phonics, children will trace each letter and then draw a line to connect the sound to the picture that it begins with. They can also play Which Letter? where they look at each picture and then circle the letter that makes the starting sound. 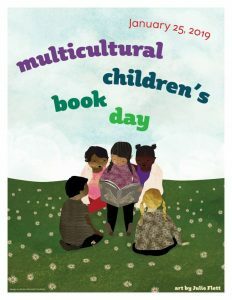 Full of bright illustrations and photographs with multicultural persons, the Giant Workbook is engaging, as well as educational. The reward chart is a bonus. My youngest child has greatly enjoyed working her way through this book and hasn’t complained at all that this is “work.” I don’t think there’s a more positive review than that.